University of Montana graduate and Polson native David Lewing was named vice president and loan officer at 1st Citizens Bank of Polson, the bank announced last week. Lewing graduated in 2010 from UM with a degree in business management. 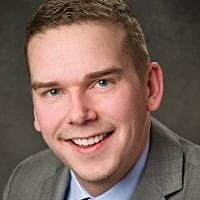 He previously worked with Glacier Bank as a mortgage loan originator. Lewing serves on the Polson Chamber Board, the Polson Chapter of Rotary International, and participates in several other community organizations. With the upcoming retirements bank executives Rick Skates and Rob Sloan, Lewing will serve as the main lender for the bank. Skates began his career at 1st Citizens Bank in 1976 and has served as president since 2001. He has won several awards for his community involvement, served on many boards, and remains an active member of the Polson community. Sloan began at 1st Citizens Bank in 1978 as a teller before advancing to executive vice president. He is also active in the community and has played a large role in many community programs. Lewing lives in Polson with his wife, Holly, and their two sons.